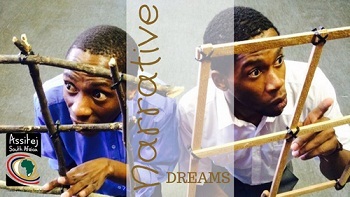 Narrative Dreams made its premiere at the National Arts Festival in Grahamstown 2014, winning a Standard Bank Ovation award, and deservedly so. Written by Lereko Mfono and directed by international award-winning director and actor, Omphile Molusi, Narrative Dreams was developed through ASSITEJ South Africa’s ‘Inspiring a Generation’ programme, where Lereko formed part of a selection of four young writers chosen to create work especially for the young. This excellent play dealing with the dreams of two young boys, was one of the highlights of the 2018 Hilton Arts Festival for me. David (Aubrey Mogale) and Morena (Titus Mekgwe) are youngsters from two completely different backgrounds but they are both strong believers in the achievement of dreams. David attends St Peter’s school run by nuns, his English is impeccable and he has eyes for Naledi, a young girl in his class. A chance remark from her about his mother tongue makes him realise that he didn’t know he even had one. His mother is dead and questions to his father are simply dealt with impatience. He determines to discover and learn his mother tongue and teach Naledi who is beginning to stir his first experiences of sexual arousal. Morena is bright and energetic and comes from a township area and is equally curious about life. His closest friend is his chicken and he talks to it all the time until the day his mother slaughters the bird for food. He discovers the pain and anger of loss for the first time. Morena is friendly with a bus driver who gives him books to read but Morena eventually admits that he would like to go somewhere awesome rather than read about it. The driver takes Morena to a tree on a sacred historical site and challenges him to climb the tree. David’s father meanwhile has decided that it is time that his son meets his mother’s family where he learns that his mother tongue is Sesotho. Things eventually progress to the stage where both youngsters end up at the tree and aim to climb it to achieve their dreams. Under Molusi’s skilled direction, Mogale and Mekgwe put in excellent performances. They take on different characters, creating credible personalities at all levels. There are clever touches such as the simple process of unrolling their trouser legs to full-length indicating that some years have passed. The set is simple. Props are laid out on the floor – dinky toys, a tie, a tiny TV, caps, books and photographs. There are two frames indicating windows – David’s very structured and Morena’s more rustic. There is a beautiful scene when the youngsters start climbing the tree.